Square flag or rectangular flag? The relative dimensions of the cross are defined in Article 1 of Federal Order #111 on the arms of the Helvetic Confederation (12 December 1889). Unlike most flags of the world, the Swiss flag is square. This was an issue when Switzerland joined the UN in 2002, as all the flags displayed on UN Plaza should have the same size. The UN first had a rectangular flag, but the Swiss mission protested. Eventually the UN accepted a Swiss square flag. But, in order to have a flag that is not too small, the flag displayed on UN Plaza has the same area of a rectangular flag. The ratio between of the cross span to the flag width is not established by law, but these two layouts show how common practice may have changed over time. The flag on the left (from Album 2000 [pay00]) has a ratio of 20�=62.5%, while the flag on the right (from Flaggenbuch 1939 [neu39]) has a ratio of 80�0=72.7%. In both cases, the 6:7 ratio specified in 1889 that defines the relative dimensions of the white cross is retained. The divisions along an edge of the 2000 version (6-7-6-7-6) are the same as those along the shorter axis of the Swiss naval ensign, whose construction details were set by law in 1953. For Switzerland: PMS 485 red. The vertical flag is simply the horizontal version turned 90 degrees clockwise (in 3:5 / 5:3 format, of course, like all Olympic flags). Another postulated explanation for the origin of the Swiss flag is that during the resistance against the Austrians, the early Swiss (mostly peasants in arms) used to stitch two stripes of white fabrics on their clothes to recognize each other during combat. From this, the white cross became the symbol of the Swiss. The red color (imperial color) came later, as it was "granted" by the Austrian Emperor. Similar to the Italian peace flag, but defaced with the Swiss cross instead of "PACE". On the 21st of June 2013, the Swiss parliament adopted the project Swissness that consists of two laws: the Law on the protection of trademarks (French: Loi sur la protection des marques) and the Law on the Protection of the coat of arms of Switzerland and other public signs (Loi sur la protection des armoiries de la Suisse et autres signes publics). That second Law was accepted almost unanimously and replaced the Federal Law of 5th June 1931 for the protection of public coat of arms and other public signs (French: la loi f閐閞ale du 5 juin 1931 pour la protection des armoiries publiques et autres signes publics) and the Federal Decree of 12th December 1889 concerning the coat of arms of the Swiss Confederation (French: Arr阾� f閐閞al du 12 d閏embre 1889 concernant les armoiries de la Conf閐閞ation suisse). The article 1 gives the dimensions of the Swiss cross: vertical white couped cross, placed on a red background and the branches, equal, are a sixth longer than wide. The article 2 says that the coat of arms is the Swiss cross on a triangular shield. There is a model in the annex 1 of the law that is binding as for the shape, the colours and the proportions. The article 3 says that the flag of the Swiss confederation is a Swiss cross in a square. There is also a model in the annex 2 of the law, also binding for the shape, the colours and the proportions. The proportions of the flag 1:1(or 32:32, that is 6-7-6-7-6 : 6-7-6-7-6), where the cross in the middle has arms with width = 6 and length=7. The article 5 says that the coats of arms, flags and other emblems of cantons, districts, circles and communes are fixed by cantonal Law. The article 10 says that flags and other emblems of the Confederation, flags and other emblems of the cantons, districts, circles and communes and signs that may be confused with them can be used, unless their use is (a) misleading, or (b) contrary to public order, morality or law. Armorial bearings, flags and other emblems of other foreign governments, including municipalities, may be used unless their use is (a) misleading, or (b) contrary to public order, morality or law. There are other dispositions in the law. The annex I of the law is binding for the shape, the colours and the proportions. The public damaging of private flags is not culpable in Switzerland (i.e. everyone has the right to destroy a flag or any other object, so long as it is one's own). However all emblems (esp. flags and coats of arms) that have been put up by an authority are protected by federal law. Stealing, damaging and insulting acts against them are penalized with prison or fine. The same applies to official emblems of foreign countries. The extent of the sentence is not specified by federal law because in case of an offence, the respective cantonal authorities determine it individually. In regards to protection of the Swiss flag from commercial misuses, there are additional laws to protect it from misuse in relation to the Red Cross symbol. According to: "Model law concerning the use and protection of the emblem of the Red Cross or Red Crescent" (31-08-1996 International Review of the Red Cross no 313, p.486-495 or http://www.icrc.org/web/eng/siteeng0nsf/iwpList276/D8ADD0310BB766F4C1256B66005A2611), Section III, Article 12 reads, "Owing to the confusion which may arise between the arms of Switzerland and the emblem of the red cross, the use of the white cross on a red ground or of any other sign constituting an imitation thereof, whether as a trademark or commercial mark or as a component of such marks, or for a purpose contrary to fair trade, or in circumstances likely to wound Swiss national sentiment, is likewise prohibited at all times; offenders shall be punished by payment of a fine of... (amount in local currency)." Aleksandar Nemet noted photographs of the Swiss flag with flames along one edge at: http://www.inmagine.com/dvs146/dvs146445-photo and http://www.pbase.com/ebrucem30/image/49103133. This is a decorative Swiss national flag, which is (as far as I know) only hoisted on a bridge in Geneva city. On this bridge all the flags fly together with the Swiss flag for a mere decorative purpose. 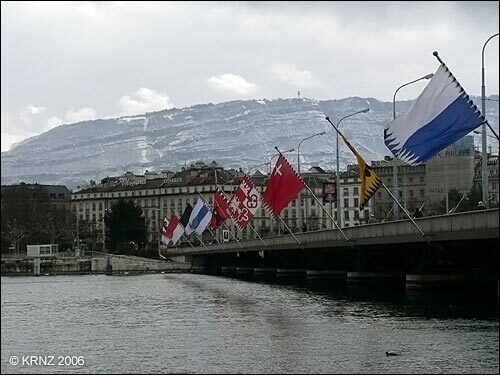 All these flags on this specific bridge over the Rhodan river, at the outflow from Geneva Lake, show a special pattern, which consists of little flames along one or more borders of the flag. Flames, though also sometimes seen in 17th and 18th century military flags all across Europe, are a specific Swiss flag design element since the 17th century until today. Flames may be placed across the flag or in the four areas separated by a white cross in varied ways, or at the edges of a flag or at the edges of a cross, or in any other possible way (like for instance in our case here). http://blog.kornemuz.com/?2006/03/12/93-le-pont-du-mont-blanc-de-geneve (Direct link to the image here.) The mountain in the background is Mt. Sal鑦e, known as the Genevans' Mountain, but located in French territory ); when they dug the Lake, the Genevans dropped all the waste in France :-) During the last football European championship, the flags were replaced by the official UEFA Euro 2008 Gen鑦e flags: http://flickr.com/photos/cmicblog/2575215059.